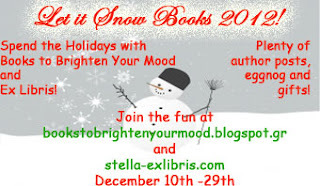 Ex Libris: Let It Snow Books Event Winners! The holidays are sadly over *sniff* and our fun Let It Snow Books 2012 Event has come to an end as well. With Anna we would like to thank all the wonderful and incredibly generous authors who participated in the Let It Snow Books 2012 Event, thank you all for the fun posts, telling us about how you spend the holidays and for sharing your books with us and our readers! Thank you for taking the time in your busy holiday season to participate and for offering such fantastic prizes, we are grateful! And thank you readers who joined us in this blogging advent calendar of sorts, we hope you had a lot of fun and enjoyed what we have planned for you, hope to see you next year, and until then, thank you for following Ex Libris and Books to Brighten Your Mood! Don't forget to visit Books to Brighten Your Mood for the list of winners of the giveaways featured there. Congratulations winners! I have sent you all an e-mail notifying you of your win, please get back to me within 48 hours or I will have to draw new winners. Thank you.